Click into the pending state card (shown) to read a description of the challenge and see which modules are in your group. The modules (leaderboard, streak, target, team, content, quote, etc...) will tell you what to expect once the challenge starts. To edit your profile picture, time zone, username, or email, head to "Profile" and hit the gear icon to get to your settings. Check into the chat before your challenges starts to see what your group is talking about. Encourage your friends, and post ideas and tips - how are you going to get your steps during the challenge? 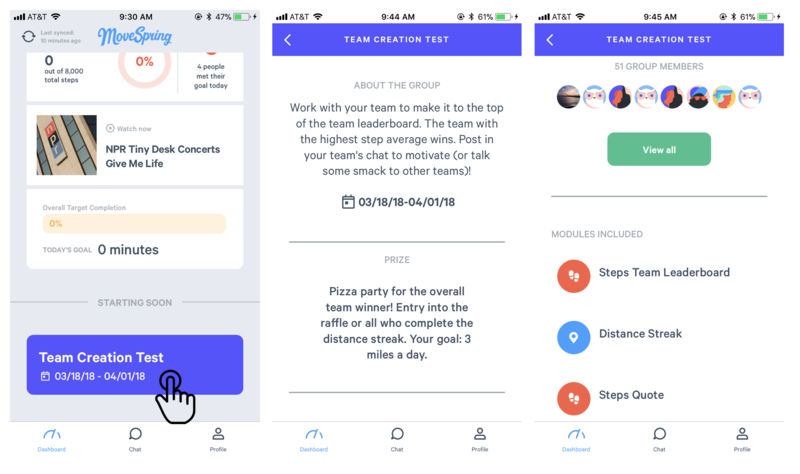 MoveSpring challenge groups are comprised of modules - pieces of the app that fit together to create an experience for you as a participant. When you view your dashboard during a challenge, you will see cards of information. Click into each card to learn more, see more data, or read more information. See the example below. If you see a <> icon in the upper right, you can click in further to learn more. During the challenge, continue to post in the chat! If your admin is including a content module in the app, don't be afraid to like and comment on content. Of course, syncing is important during the challenge. If you need help connecting, head to "Profile" and click the gear icon in the upper right to access your settings. Click the green "Message Support" button to talk to us and get help connecting!